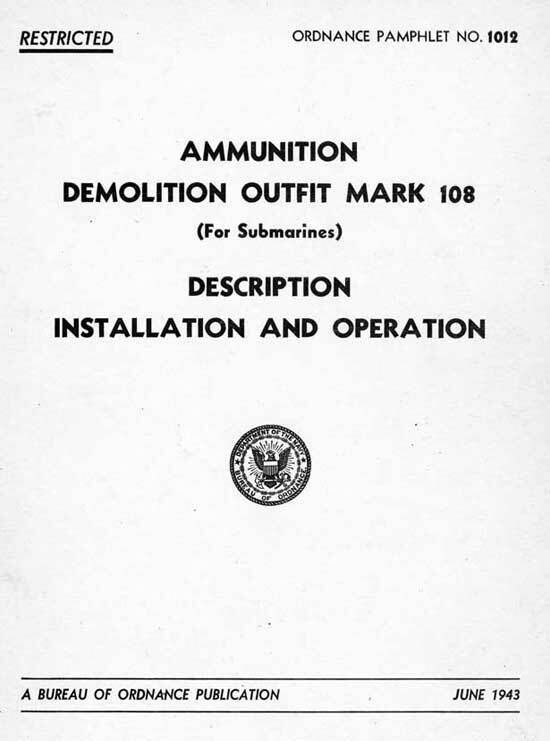 Ammunition Demolition Outfit Mark 108 (For Submarines), Ordnance Pamphlet 1012, 1943, describes the self destruction demolition device used to prevent the intact capture of a submarine. 7(a) - If one or more torpedo warheads are to be used for demolition or scuttling purposes, and Demolition Charges Mark 2 are not available, the warhead should be selected and fitted with a cork plug, furnished as part of the outfit. Install the blasting cap in each of the Demolition Charges Mark 2 as outlined in paragraph 19. (b) If Demolition Charges Mark 2 are not available and torpedo warheads are available, place one blasting cap in the booster of one of the forward torpedo warheads and one blasting cap in the booster of one of the after torpedo warheads. Install the blasting caps as outlined in paragraph 7. (c) If only Demolition Charges Mark 2 are available, place the Demolition Charges in position. one forward, one aft, and one amidships. Install the blasting caps in Demolition Charge Mark 2 as outlined in paragraph 19. 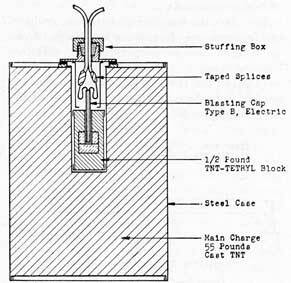 (1) Run out the single conductor cable in general accordance with the schematic wiring diagram (Figure 5), and splice blasting cap wires to the cables, making certain that the "shorting" clip is removed from the detonator wires and that the splices are well taped. If for any reason it is necessary to shorten the leg wires of the blasting cap, all enamel must be scraped from the part of the leg wires used for making the final connection. (2) Set up the timer and battery box in its prearranged location. Check batteries by flashing the test lamp. Set the timer dial to the delay period desired. Connect the two cables from the demolition charges (or from the warhead booster cavity, if applicable) to the box terminal. Cut the retaining wires from the three plate screws, remove screws and safety plate from timer. (3) Throw timer toggle switch to the "ON" position. 18. Dry cell deterioration, particularly under unsatisfactory storage conditions, is rapid. If the ship has suitable storage batteries to furnish a source of current not more than 24 volts and not less than 12 volts, it is desirable, if circumstances permit, to utilize the source of current from the storage batteries by attaching the storage batteries in series with the dry cells. charges. If the electric blasting cap extends more than 7/16" from the end of the booster detonator well, it is not properly placed and low order detonation is likely to occur. 20. The Demolition Charge Mark 2 shall be right side up when and after inserting the blasting cap to prevent any slight withdrawal of the blasting cap from contact with the tetryl pellet of the booster. 21. 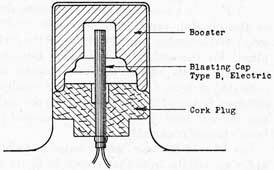 In the blasting cap assembly with a torpedo warhead (Figure 4), care shall be exercised to insure that the blasting cap is pushed far enough through the cork and the cork pushed close enough to the booster to obtain as initimate a contact with the tetryl booster of the warhead as possible. 4. Add paragraph 22, as indicated below, under the heading of "Special Notice"
22. The preferred arrangement for utilizing Demolition Outfit Mark 108 is as outlined in item 8(a) above, and alternate arrangements described herein are described to take care of any limiting conditions that may occur. Requests for additional copies of OP 1012 Change I should be submitted on NAVORD FORM 1, ORDNANCE PUBLICATIONS AND FORMS REQUISITION, to the nearest Ordnance Publications Distribution Center: Navy Yard, Wash. 25, D. C.; Adak, Alaska; Mare Island, Calif.; OrdPubSubcen, NSD, Guam Island, Marianas; Pearl Harbor, T. H.; Manus Island, Admiralty Islands. Distribution Center Mailing addresses should be obtained from List 10 nn of the Standard Navy Distribution List, or from the reverse side of NAVORD FORM 1. 1. Ordnance Pamphlet No. 1012 contains information on the installation, operation, and maintenance of the Demolition Outfit Mark 108. This outfit consists of a Mark 3 timer and battery box, Mark 2 and 4 demolition charges, blasting caps, and conductor cable. 2. This publication is primarily for the use of competent ordnance personnel aboard units of the fleet. If the need is warranted, the Demolition Outfit Mark 108 may be used by demolition units ashore. 3. Ordnance Pamphlet No. 1012 is a new publication and does not supersede any existing Ordnance Pamphlet. It will become effective upon receipt. 4. This publication is Restricted and should be handled in accordance with the provisions of Article 76, U. S. Navy Regulations, 1920. 1. The Purpose of the Demolition Outfit Mark 108 is to provide a means for scuttling a submarine at a predetermined time (between 15 minutes and 5 hours) subsequent to its abandonment. 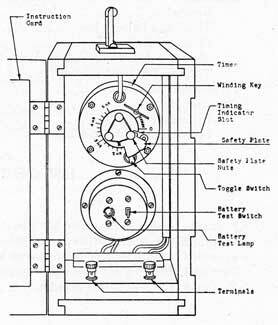 Figure 1.-Timer and battery box-battery end. 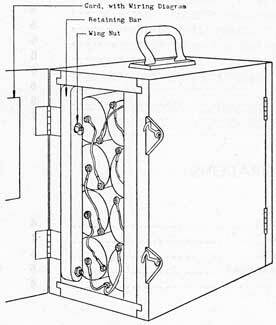 (b) Eight standard 2 1/2 by 6 inch dry cells, with screw terminals, to be procured from store and installed in the timer and battery box by ship's force before commencing each patrol. Figure 2.-Timer and battery box-timer end. (d) Eight blasting caps, type B, electric. These caps are also known as the "Army Engineer Special." Each cap has two insulated wires, 12 feet long, which are "shorted" by means of a small metal clip to prevent functioning due to stray or induced currents while in storage. The clips must be removed before the caps are used. (e) One packing or stowage box for the eight blasting caps. (g) Six hundred-foot single conductor, insulated cable. Furnished in three coils of 200 feet each. 3. General.-Check all items received to insure that a complete outfit, including a set of dry cells, is on hand. 4. Timer and battery box Mark 3. (a) Open up the timer and battery box and remove the seven battery connectors found inside, Loosen the wing nut (see fig. 1) and rotate the retaining bar outward and down, permitting insertion of batteries into the battery compartment. Connect the green and blue wires, at bottom of compartment, to opposite terminals of the two lowermost batteries. Connect all batteries in series, using the seven connectors furnished in the box. Test the battery installation by throwing the test switch (see fig. 2) and observing the test lamp. If the lamp lights brightly, the installation may be considered satisfactory. If light is dim, or does not light up at all, check the wiring. If this fails, test each battery by standard methods. With the safety plate on the timer, check for OPEN circuit between the two large terminals, or binding posts, at the bottom of the panel compartment. Remove safety plate and allow timer to start running. Throw the toggle switch on the timer to the "ON" position and recheck for OPEN circuits between the two terminals. Permit timer to run until it reaches "0" time and check for "CLOSED" circuit. This condition corresponds to "FIRING" the demolition charges. (b) At the discretion of the Commanding Officer, the timer may be set to run various lengths of time and the actual time of operation checked. A "calibration card" so derived may be made up and attached to the box for future reference. Figure 4.-Blasting cap assembly-torpedo war head. close and hook door shut. Check battery compartment for foreign matter; check all battery terminals to insure their tightness; close and hook door. (d) Place the box in a secure and dry stowage place, where it cannot be tampered with. 5. Blasting cap packing box. Provide a suitable and safe stowage place for the blasting cap stowage box, in accordance with existing regulations pertaining to the stowage of detonators. 6. 55-pound demolition charges Mark 2. Open up the booster cavity of the demolition charges Mark 2 by removing the four screws surrounding the top center part. Examine cavity to insure that the 1/2-pound TNT-Tetryl (or compressed TNT) block booster is in place. Replace the cavity cover. Check the stuffing box. The charge may remain in its shipping crate if so desired. Stow the three charges in appropriate locations. 7. Torpedo war head assembly. (a) If one or more loaded torpedo war heads are to be used for demolition or scuttling purposes, in lieu of the 55-pound demolition charges, such war heads should be selected and fitted up with the cork plugs furnished as part of the outfit. (b) Check the cork plugs by trying one of of the blasting caps for fit through the central hole of each plug. (c) Provide a wooden dowel of the same size as the blasting cap (0".275 diameter by 3".0 long) and assemble it in the center of the cork plug. Fit the cork plug and dowel into the detonator cavity of the war head booster as indicated in figure 4. If any war head requires different fitting of the cork plug, both the cork and the war head should be clearly marked to insure proper reassembly. (d) Should the war head booster assembly differ materially from that shown in figure 4, any suitable means at hand may be utilized to provide a substantially similar assembly. The primary object sought is, of course, the detonation of the war head booster by the blasting cap. (a) Place the demolition charges in position, one forward, one aft, and one amidships. Open up booster cavities preparatory to installing blasting caps. (c) Install blasting cap in each demolition charge (or war head). Splice blasting cap wires to the cables, making sure that the "shorting" clip is removed from the detonator wires and that the splices are good and are well taped. (d) Set up the timer and battery box in its predetermined location. Check batteries by flashing the test lamp. Set the timer dial to the delay period desired. Connect the two cables from the demolition charges to the box terminals. Cut the retaining wire from the three plate screws, remove screws and safety plate from timer. (e) Throw timer toggle switch to the "ON" position. 9. The outfit is now in operating condition and will fire at the expiration of the set time interval. 10. Caution. Not more than three blasting caps shall be connected in series when using this outfit. 11. The personnel to be responsible for setting up and operating the outfit shall become thoroughly familiar with the operation of the timer, the assigned location of all components, both in stowage and in action, and the method of installing and connecting the blasting caps and wiring. 12. The connecting cables, cork plugs, and specially made items, such as wedges, etc., required for fitting into war heads, should be bundled and labelled as to their purpose, and stowed away carefully, to avoid their inadvertent use for other purposes. 13. The blasting caps must be kept in the stowage box until ready for use. The timer and battery box should require no maintenance, other than keeping it in as dry and protected place as is practicable. Batteries should be exchanged for fresh ones before starting a patrol, or oftener if desired and opportunity presents, to insure that batteries will be good when needed for action. 14. The instructions and descriptive data included on the card attached to the inside of the timer compartment door should be studied carefully in conjunction with the instructions herein contained. 15. The tactical uses of this outfit will be covered by separate instructions. 17. List of applicable drawings. * Electric Boat Co., Groton, Conn.; Manitowoc Shipbuilding Co., Manitowoc, Wis.
(1) Commandant and Superintendent, United States Naval Gun Factory, Navy Yard, Washington, D. C.
(2) Commandant, Navy Yard, Mare Island, Calif.
(3) Officer in Charge, Ordnance Publications SubCenter, Naval Supply Depot, Pearl Harbor, Hawaii.